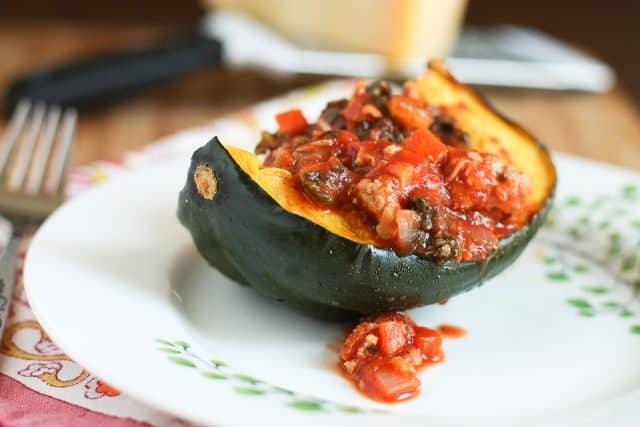 Roasted Acorn Squash Bolognese is hearty, healthy and low carb. Enjoy it on cozy winter nights. 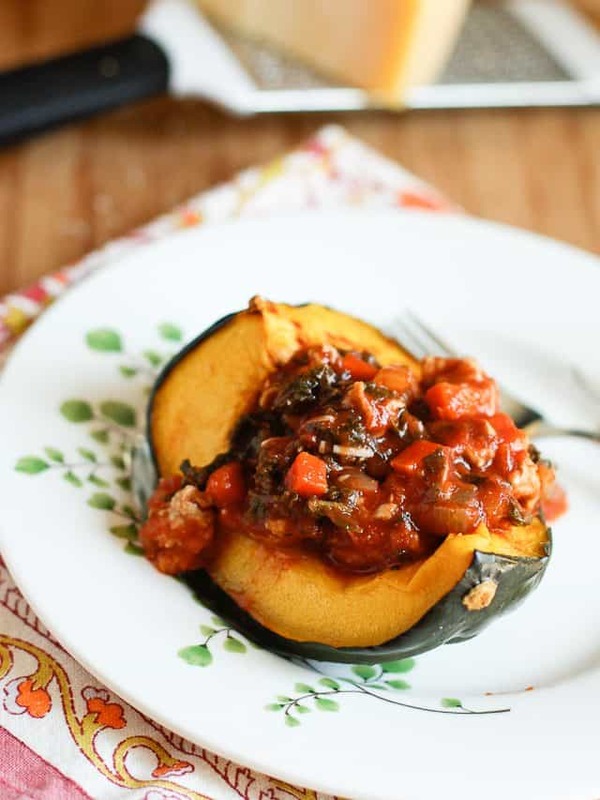 Click here to pin this Roasted Acorn Squash Bolognese recipe! Leftovers…love ’em or hate ’em? I have mixed feelings about leftovers. They aren’t something that I normally get excited about, but I’m usually grateful for, especially at lunchtime the next day. I especially love when I can take leftovers and create something “new” with with them. This Roasted Acorn Squash Bolognese is a leftover mash-up (of these two recipes) that I enjoyed for lunch a couple of weeks ago. I’ve never eaten acorn squash this way and it was absolutely delicious! I had just enough left over for a great low-carb meal for one…but this could easily be prepared for dinner. I love roasting acorn squash this way, it is simple and once it’s cooked up you just grab yourself a fork and knife and dig in. 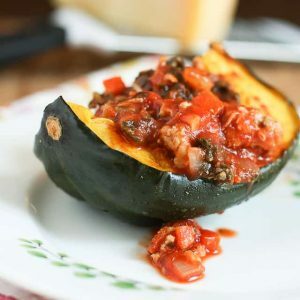 The squash cuts right off the skin, and when it’s topped with a hearty turkey and kale bolognese sauce it becomes such a filling, healthy meal that is truly perfect for this time of year. With the time change and the evenings creeping up earlier I’m always craving warm, comfort food for dinner. Having lower carb options that down weigh me down is always a good thing. The shorter days definitely make the evenings more cozy, wouldn’t you agree? I feel like it forces us to slow down a bit more, and just relax. I’ll take it. Carefully cut acorn squash in half, then cut halves into quarters. Scoop out seeds and discard. Place on baking sheet and drizzle olive oil over top of each quarter. Sprinkle with salt and pepper and bake in oven for 30 minutes.